Historians often refer to the period from Qin dynasty to the end of Qing dynasty as Imperial China. Though the unified reign of the First Qin Emperor lasted only 12 years, he managed to subdue great parts of what constitutes the core of the Han Chinese homeland and to unite them under a tightly centralized Legalist government seated at Xianyang (close to modern Xi’an). The doctrine of Legalism that guided the Qin emphasized strict adherence to a legal code and the absolute power of the emperor. This philosophy, while effective for expanding the empire in a military fashion, proved unworkable for governing it in peacetime. The Qin Emperor presided over the brutal silencing of political opposition, including the event known as the burning of books and burying of scholars. This would be the impetus behind the later Han synthesis incorporating the more moderate schools of political governance. Major contributions of the Qin include the concept of a centralized government, the unification of the legal code, development of the written language, measurement, and currency of China after the tribulations of the Spring and Autumn and Warring States periods. Even something as basic as the length of axles for carts—which need to match ruts in the roads—had to be made uniform to ensure a viable trading system throughout the empire. Also as part of its centralization, the Qin connected the northern border walls of the states it defeated, making the first Great Wall of China. Generally speaking, the record of these scholar-gentlemen has been a worthy one. It was good enough to be praised and imitated in 18th century Europe. Nevertheless, it has given China a tremendous handicap in their transition from government by men to government by law, and personal considerations in Chinese government have been a curse. 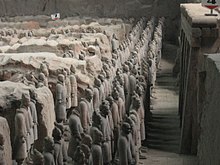 After Emperor Qin Shi Huang’s unnatural death due to the consumption of mercury pills,the Qin government drastically deteriorated and eventually capitulated in 206 BC after the Qin capital was captured and sacked by rebels, which would ultimately lead to the establishment of a new dynasty of a unified China. Despite the short 15-year duration of the Qin dynasty, it was immensely influential on China and the structure of future Chinese dynasties.